single-action ignition. This cool torch comes complete with a protective cap for safe keeping. Comes in an assortment of eye-catching colors. This is an awesome lighter. I liked it so much I purchased 2 more for my cigar smoking buddies. This lighter will properly light a cigar in all conditions and will help eliminate a cigar not burning properly. You can also weld with it . For 15 bucks you cant go wrong. I wanted an angle lighter for some time and this was at very great price. Very good lighter for the price. Especially good for windy days on golf course. 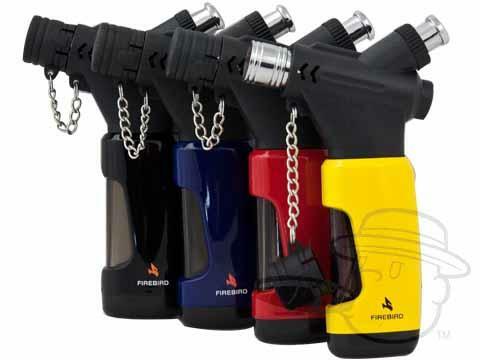 Firebird Hookah Torch Lighter By Colibri - Assorted Colors is rated 4.2 out of 5 based on 6 customer ratings. Can I choose the color I like? How do you Order the color that you want to buy? You can select your color preference for your purchase of the Firebird Hookah Torch Lighter by Colibri during the order process under the "special instructions" section. Yes, they are all refillable. They use butane exclusively.